Update: The categories WordPress.com Tips and Blogging Tips, as well as the Ask the Geek page have been removed from TGB. All blogging tips are merged together in the Blogging 101 category. Did you notice I added a new page to TGB? It’s a companion to my WordPress.com Tips and Blogging Tips called Ask the Geek where readers can ask questions having to do with wordpress.com and blogging in general. 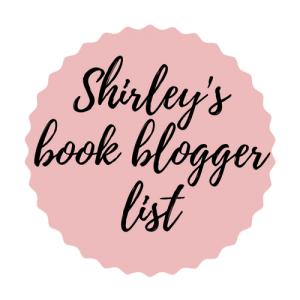 I’m very excited to kick it off today with a question from Ezi over at Oh My Shelves. I want to improve my blog. How do I add the Instagram to my blog? Also, on my reviews, how do I get the “add to goodreads” button? You can add an Instagram widget to your blog. I’m not familiar with worpress.org, so I’ll link you to the page that describes how to do this. Click here. Click Customize in the lower right corner of your blog. 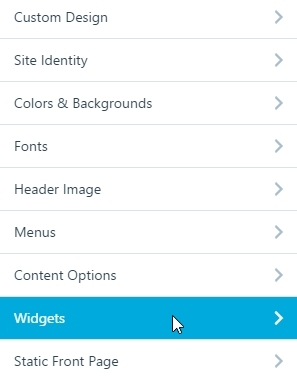 In the Customizer menu, click on Widgets, Sidebar (or Footer), Add Widget, and finally Instagram. 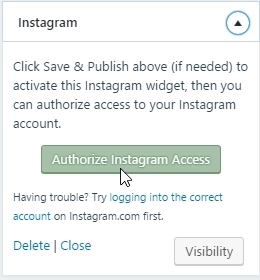 As the widget says, you’ll should click Save and Publish, because clicking on Authorize Instagram Access will temporarily take you out of the customizer. Once authorized, you will be able to choose how many images will be displayed (1 – 20) and the number of columns (1 – 3). Click Save and Publish and you’re all set! Right click and select Save image as… to download the button, and upload the image to your blog. Then all you have to do is insert the image where you want it in your post. Clicking on an image will give you the option to change the image alignment—left, center, right, or no alignment. You will also be able to increase or decrease the size of the image, or even add a caption. It’s also the first step in making your image—the ‘add to Goodreads’ button, in this case—into a link. And that’s all you have to do to use any image as a link. I’m going to try out the steps today and see if it works for me. The Instagram process can be a pain for anyone who is not familiar! You always choose the right topics to be most helpful 🙂 Love it! Those widgets can drive you nuts! I remember having a heck of a time figuring out how to make the Goodreads widget work properly. What a headache that was! All the credit for this topic goes to Ezi. I was thinking about making a page where blogging questions could be asked when Ezi contacted me with her questions. Serendipity! There’s a lot about WordPress that isn’t user-friendly. It can be, but only with clear instructions rather than the bare-bones vagueness we have now. It is definitely vague.. and I am finding there is not as much info floating around as you would expect. Exactly! That’s what motivated me to share what I’ve learned. It’s nearly impossible to find answers to the simplest questions.